I don’t know if I’ve mentioned this already, but my boyfriend and I have decided to make Wednesday nights our “date night” so you’ll have to excuse me if my Wednesday posts come up a bit short. Tonight we took advantage of a 2-for-1 coupon at TGI Friday’s then went and saw the new movie Fired Up. I’m starting to think that one of the voices in my head is a 14-year-old boy because I find movies like Fired Up hilarious. Superbad: hilarious. College: hilarious. Pineapple Express: down right side-splitting. Maybe it’s the juvenile humor, or the cheesy story lines. Or maybe I just laugh too easily (which, by the way, I don’t see as a bad thing). 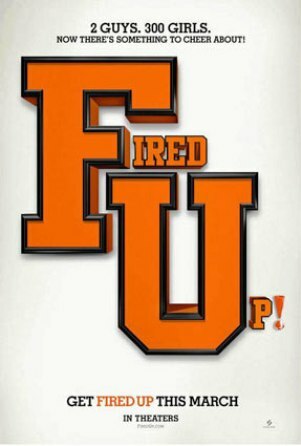 Whatever it is, Fired Up kept a smile on my face the whole 90 minutes. Oh! And my new favorite word? Nob-Rocket!! Both positive and negative feelings arise after seeing this movie.Some of the scenes made me laugh.However most other scenes were based on old jokes.Even the story was not so interesting.And its aimed for the teenage guys only.Don’t take your girlfriend to this movie! Overall I think this movie should be rated 3.5/5.